If you like banana bread, you are going to love this! 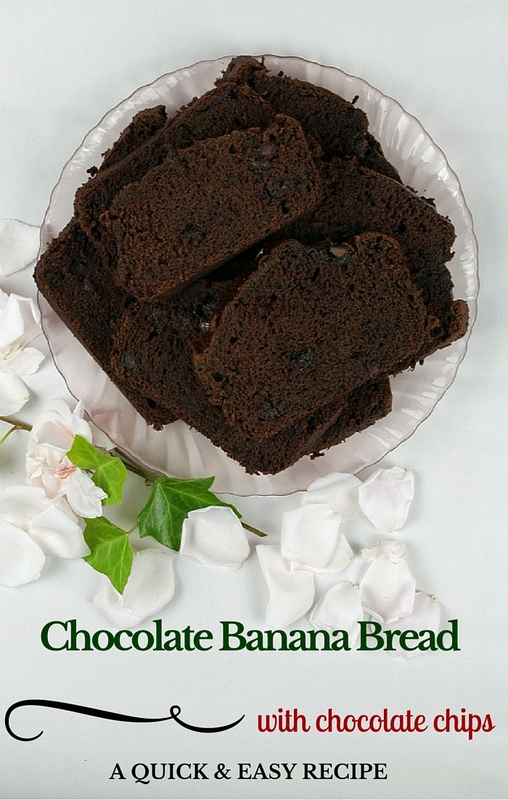 Chocolate Banana Bread – with chocolate chips too! Have you ever bought a bunch of bananas, only to have the last few turn all brown and mushy? Well, those are the perfect ingredients for banana bread! If you don’t have time to bake right away, just peel the bananas and freeze them. Most recipes call for 3 bananas, so I mush 3 per container and pop them into the freezer. Be sure to label that container though! 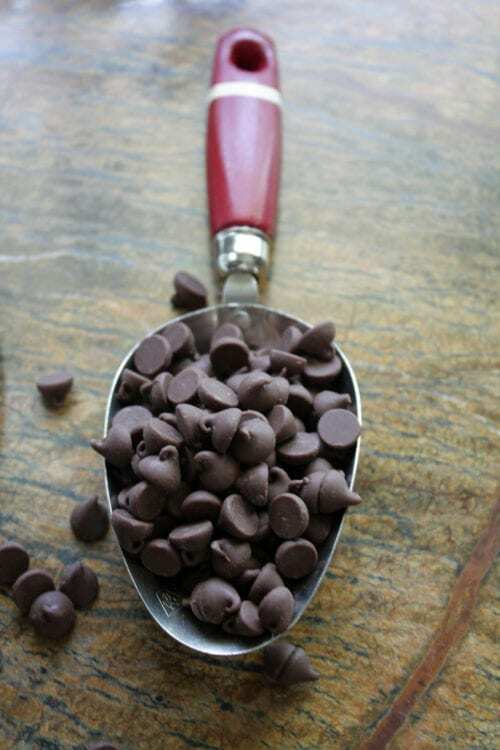 This recipe is really simple, and clean-up is a snap if you use a KitchenAid mixer! 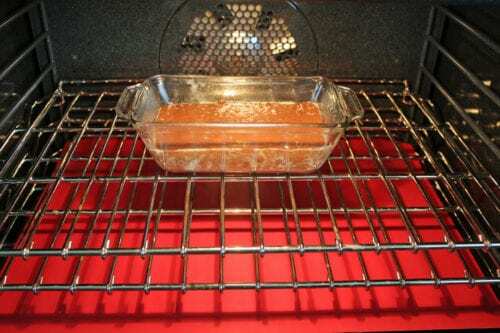 Preheat the oven to 350° and spray a 1.5-quart glass loaf pan with baking spray. In a Pyrex 2 cup measure melt the butter in the microwave. Do this 30 seconds at a time until the butter is melted. Once the butter is melted, add that to the bananas and continue mixing on 1. Add the brown sugar, Splenda & salt – keep mixing at 1. Add the egg, and turn the mixer up to speed 2. Once all those ingredients are thoroughly combined, turn the speed down to 1 and add the vanilla extract. Turn the mixer off while you prepare the dry ingredients. 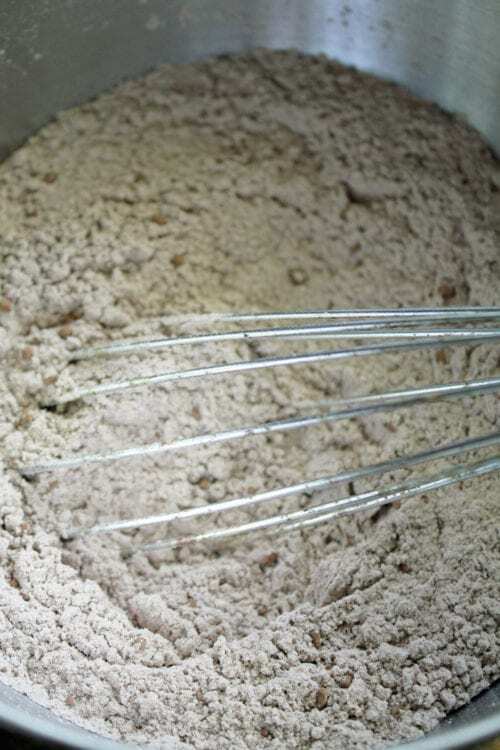 In a separate bowl, add the flour, cocoa powder, baking soda and spices. Whisk together with a metal whisk, which will also break up any clumps. Turn the mixer back on to speed 1, and slowly add the dry ingredients. Turn the mixer off and scrape the sides with a rubber spatula. Back to speed 1, and add the chocolate chips. No need to mix for any longer than a few seconds! 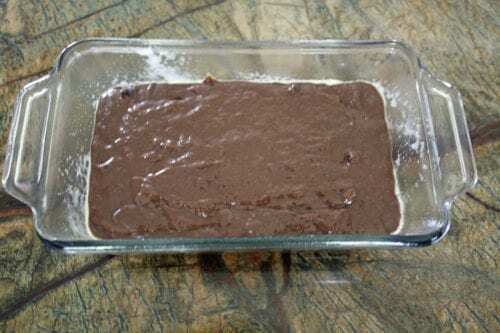 Using the rubber spatula, scrape the batter into the greased Pyrex loaf pan. Smooth out the top of the batter with the spatula. Place the loaf pan on the center rack of the preheated oven. Bake at 350°for 55 minutes. Let the Chocolate Banana Bread cool a little before you eat the whole thing! For more easy, yummy recipes and DIY tutorials, visit me, Donna Berlanda at donnaberlanda dot com. I DO love banana bread and I bet I WOULD love this!! Pinning for later 🙂 Thanks for sharing at #SmallVictories Sunday linkup! Mm!! Can’t go wrong with chocolate and bananas! Thanks for sharing your tips. I am so glad that you like the recipe! Thanks for stopping by and leaving a comment Julie. Could use regular flour instead of unbreached? Would you use the same amount? Great question Joanne! Yes, the two flours can be interchanged and you would use the same amount. The difference between the two is how they are aged. Bleached is given agents to age faster while unbleached is aged naturally.